I could write a 10,000 word blog about today, but I'm just going to keep my big trap shut. A bit frustrating, but it's the right thing to do I guess, being an adult and all. But ooooh this couldn't have been SUCH a funny blog post! Instead, it'll be kinda lame I guess. At my table today was Barry Greenstein, Jason Lester, Matt Brady, Mig.com, Clonie Gowan, and a 21 year old internet kid who I've played with before. I started out firing away in the first few levels. We started 1000 big blind deep, so there was little risk in terms of survival. Since my opponents seemed happy to play it careful early, I took advantage of that by playing very aggressively. I won 13,000 in the first round with 50-100 blinds and I never really had a hand to speak of. I tried one bluff against Barry Greenstein that cost me about 20,000 in chips, but other than that I didn't play any other huge pots really. Overall I was very happy with the way that I played. I was attacking a lot of pots and playing pretty sophisticated. 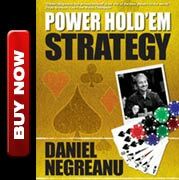 It's a fine like between sophisticated and bad, though, when it comes to tournament poker. The way that I played today was a good approach for cash games, but isn't ideal for tournament poker. Since we were so deep, though, I treated the early stages more like a cash game. I did a decent amount of three betting, and that's something I just don't normally do because we are usually not deep enough to play that way in a typical tournament. When I got home I chipped in the backyard for a few minutes then watched Celebrity Apprentice. Normally when I watch reality shows I comment on them in my blog, but in this case I don't think it would be appropriate. Vancouver up 3-0 this was my lock of the century. I wanted to bet a million on this series because I see Vancouver as an elite team while St.Louis just doesn't have enough firepower to get past them. New Jersey up 2-1 after a big win in Carolina. It was a huge win after losing game 2. N.Y. Rangers up 2-0 on the road. I got 2-1 on the Rangers and thought that was a joke. Sometimes in the playoffs you really need to ride a goaltender and Lundqvist can be a world beater while Washington just doesn't have that same kind of backstop. Philadelphia down 2-1 to Pittsburgh. They could have won game 2, and my biggest fear with the Flyers was their weak goaltending and it's proving to be an Achilles heel for them. But, they did win game 3 handily so if they can hold court in game 4 they'll just need to steal one in Pittsburgh. Montreal down 2-0 to Boston. The Canadiens could have won that first pivotal game but fell short. In game two Carey Price was chased from the nets as they got blown out. The series isn't over, but I don't like what I'm seeing at the moment and it doesn't look good here. Anaheim up 2-0 on the road in San Jose. Gosh, like I said, a terrible first round match up for San Jose. I swear there isn't a first round match up that could have been worse for them outside of Vancouver or Detroit. Anaheim is getting superb goaltending and scoring when they need to. The Sharks are in trouble. Chicago up 2-0 against Calgary. I can't believe I didn't pull the trigger here. I thought I'd be betting the Blackhawks for sure but was a bit surprised by the price. Detroit looks like a well oiled machine up 2-0 versus Columbus. This was also one I had written down to bet then just felt a bit silly laying 4.57 to 1. All in all I'm on the right side in 6 of the 8 I posted. Not too shabby. There was talk in the forums that I couldn't beat a 10-20nl online and I posted that I'd be willing to bet a substantial amount that I could. One kid with the screen name 2easy was vehement about it, almost like he had proof it was impossible! So for fun I told him I'd play him heads up $25-$50 on PokerStars for a while. 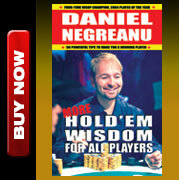 No strings attached, no side bet, just play since he is a heads up specialist. We played 350 hands and I won $6175. I've played some pretty tough opponents online and in comparison, this guy was a bit 2easy (haha had to throw that out there). I've played guys like Genius28, Isaac Haxton, BrynKenney, and Stinger88 and they all were very tough to play against and showed a deep level of sophistication. This kid, "2easy" just isn't quite as sophisticated, and that's likely because he avoids the top competition for the most part. That's smart game selection on his part for sure. I told him I'd play him 5000 hands in the thread, but I honestly don't think he'll make it that far. I predict that within like 2000-2500 hands he'll realize that it's a bad spot for him and quit. Only reason I'm doing it is because I thoroughly enjoy it! It was pretty fun. Young kid challenges you, you man up and give him a game as long as he can play at decent sized stakes. Why not? I finished the night with 89,325 and the blinds are going to be 400-800 tomorrow. That's a ton of chips really and I am happy with my play at the moment. 2easy will have to wait for a rematch when my tournament is over.